Lithium-ion sieve (LIS) formation technology for Li+ recovery from seawater or brine is very important. In this article, the different types of H1.6Mn1.6O4 (HMO) composite adsorbents, including granular (HMO/PAN-G), nanofiber flat-sheet membrane (HMO/PAN-NM), flat-sheet membrane (HMO/PAN-FM), and hollow-fiber membrane (HMO/PAN-HFM) adsorbents, were prepared via the phase-inversion method using hydrophilic polyacrylonitrile (PAN) and Li1.6Mn1.6O4 (LMO) as the binder and precursor, respectively. 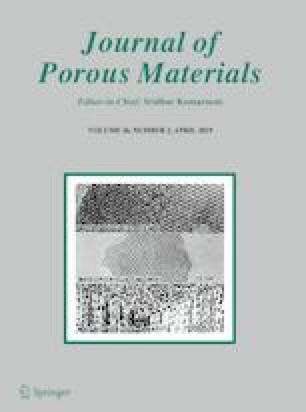 The effects of the formation methods on the morphology, structure, and Li+ adsorption performance of the different types of HMO/PAN composite adsorbents were investigated. The adsorption performance of HMO/PAN-HFM was better than HMO/PAN-G and HMO/PAN-FM owing to its high porosity (88.1%). Results indicated that HMO/PAN-HFM (HMO = 50 wt%) exhibits optimal adsorption performance, with an optimum adsorption capacity of 18.1 mg g−1, corresponding to 91.4% of the adsorption capacity of HMO powder (19.8 mg g−1). Using Li+ solutions and simulated brine, the Li+ adsorption percentages were found to be 91.8% and 87.6%, respectively, at 12 h. The Li+ selectivity of HMO/PAN-HFM was 183–453 times those of other metal ions. These results indicate that PAN is an excellent carrier of HMO, and high-porosity HMO/PAN-HFM is promising as an LIS composite adsorbent. The authors would like to thank the Program for Changjiang Scholars and Innovative Research Team in University (IRT_15R46).